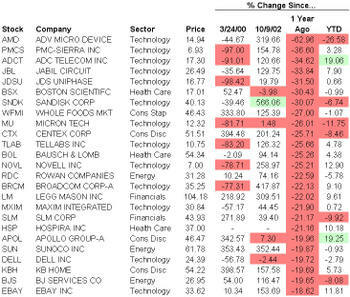 Over the next couple of days, we will be highlighting the best and worst of the S&P 500 based on numerous categories. For our first installment, we take a look at share price performance (not total return) of current S&P 500 members. 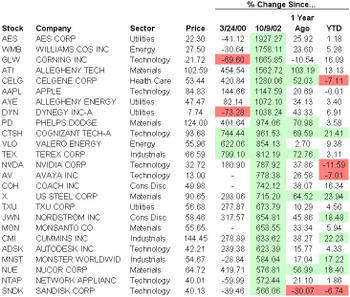 The first two tables list the best and worst performing current S&P 500 stocks since the bear market began on March 24, 2000 (it ended on October 9, 2002). XTO Energy leads the top 25 list with a whopping return of over 2,188%, while JDSU has fallen over 98%. 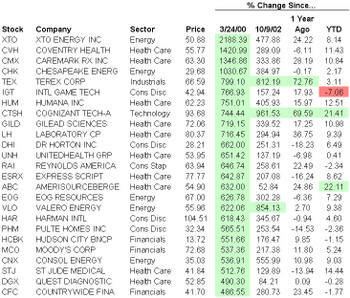 The list of winners is led by health care names while the list of losers is pretty much all tech and telecom. 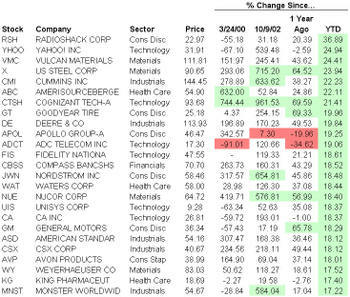 The next two tables highlight the price performance of current S&P 500 stocks since the bull market began on October 9, 2002. 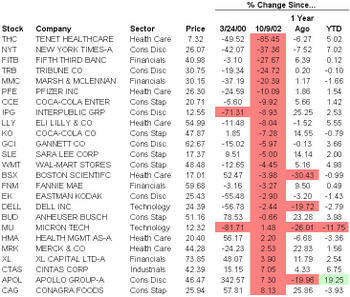 The thing that stands out the most from these lists is that only 18 of the 500 stocks in the index at the moment have seen their share prices decline during this 4 year+ bull market. Looking at the top and bottom 25 over the last year, we see much more muted gains, as only one stock (ATI) is up over 100%. 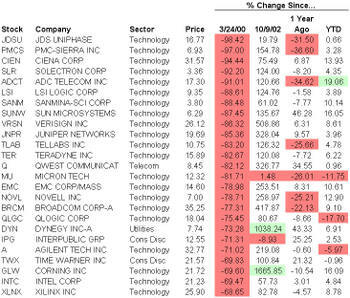 Technology stocks again lead the list of losers. And finally, we see that RSH and YHOO are off to a good start for 2007, while AMD continues to struggle. 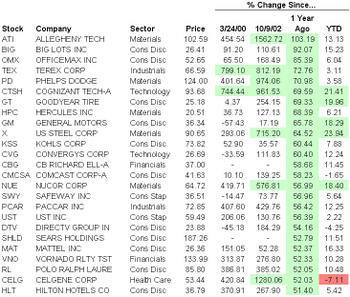 Only one stock made the top 25 list for each of the time periods we analyzed: Cognizant Technology (CTSH). 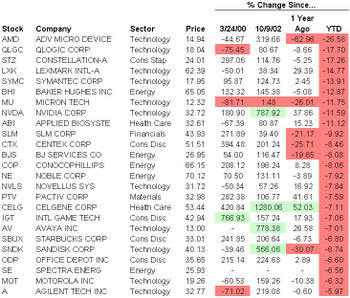 Unfortunately for Micron Technology (MU), it is the only company that made all four bottom 25 lists. Although I admit that the Christmas Holiday period is my least favorite holiday period (other than, say, Valentine's Day, St. Patrick's Day and New Year's) I did have a reasonably good time during my trip to Denver.